Shared-nothing multiplex is a storage architecture for massively parallel processing (MPP) of big data, wherein primary data is stored on a set of direct-attached storage (DAS) devices spread across a set of servers, rather than on a shared storage area network (SAN). Shared-nothing multiplex is not supported on Windows platforms in this release of SAP IQ. Shared-nothing multiplex does not support point-in-time recovery in this release of SAP IQ. Shared-nothing multiplex does not support row-level versioning (RLV) in this release of SAP IQ. Shared-nothing multiplex is the latest in a series of scale-out features that began with SAP IQ 15.3. Shared-nothing multiplex provides I/O scale-out, where local direct-attached storage can achieve higher I/O performance than SAN. 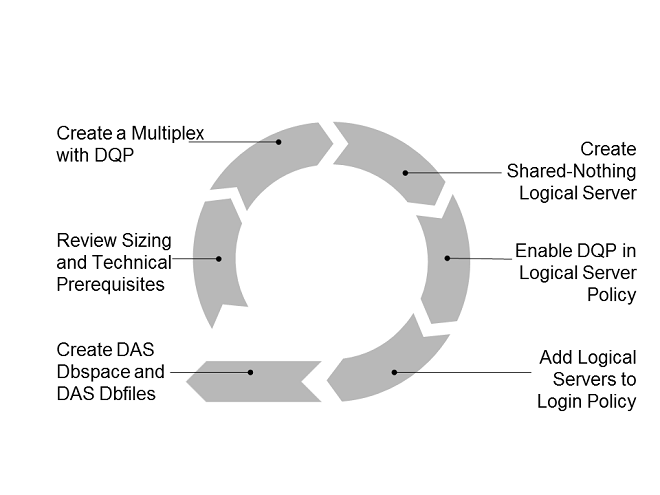 SAP IQ maintains its flexible architecture; your implementation can combine shared-nothing dbspaces with traditional shared dbspaces. Moreover, your shared-nothing dbspace can contain shared file system (SFS) files. See Shared File System DAS Dbfiles. Do not confuse DAS dbspaces with cache dbspaces. The DAS dbspace is a primary data store, whereas the cache dbspace caches persistent data from main dbspaces. The cache dbspace is a high-speed buffer pool extension dbspace composed of one or more DAS devices attached to a simplex or multiplex node. The cache dbspace caches copies of locally-used IQ main store read-only pages, reducing access requests to the IQ main store devices. The cache dbspace, however, is compatible with shared-nothing storage, and can improve data access performance for any data violating affinity. DAS dbfile data with affinity is never written to the cache dbspace file. Like other multiplexes, you need to set up Transport Layer Security (TLS). In a shared-nothing multiplex you configure TLS for DAS internode communications, as well as for INC and MIPC connections. Before you can load and query data in your shared-nothing multiplex, follow these steps to create shared-nothing storage. Review sizing and technical prerequisites. Create a multiplex with DQP. Create a shared-nothing logical server. Enable distributed query processing (DQP) in the logical server policy. Add all shared-nothing logical servers to the login policy. Create a DAS dbspace and DAS dbfiles. You are now ready to load data to your shared-nothing multiplex, and run queries against it. For details, see Shared-Nothing Multiplex in Administration: Multiplex . A DAS dbspace is an IQ main store dbspace for shared-nothing storage of primary data, where the data is stored on a set of DAS devices. A DAS dbspace is associated with one logical server, and contains a set of DAS dbfiles, and their mirror files, within the logical server. You can create multiple DAS dbspaces for the logical server. Each DAS dbspace, however, must be associated with one logical server. The members of the logical server must be excluded from other DAS dbspace logical servers. The size and speed of DAS devices in the DAS dbspace should be nearly identical across all physical servers to ensure even data distribution, and consistent performance. A DAS dbfile is an IQ main store dbfile physically located on a DAS device attached to one server. It can be a raw partition, or operating system file. A DAS dbfile is always contained within a DAS dbspace and is always associated with one logical server. DAS dbfile mirroring (optional but recommended) ensures high availability in a shared-nothing environment by creating one or more redundant copies of a DAS dbfile on other physical servers in the logical server. When mirroring exists, the original file is known as the primary DAS dbfile; the redundant copy is known as the mirror DAS dbfile. Each writer node in the logical server requires a primary DAS dbfile. A writer node without a primary DAS dbfile causes an OUT OF SPACE error. You can combine shared file system (SFS) DAS dbfiles, and non-SFS DAS dbfiles, in the same DAS dbspace. Non-SFS DAS dbfiles reside only on their respective local nodes, and cannot be moved to other nodes in the DAS dbspace. SFS DAS dbfiles, on the other hand, can be reassigned to other nodes in the DAS dbspace. Both SFS DAS dbfiles and non-SFS DAS dbfiles use the same type of "hard" affinity mapping, where you use the SERVER keyword to specify the physical server associated with a DAS dbfile. You can combine SFS and non-SFS DAS dbfiles in your shared-nothing multiplex, which gives you design flexibility. In SAP IQ 16.0 SP 10, SFS is supported for primary DAS dbfiles only. A primary DAS dbfile is a dbfile that is not a mirror copy. You specify that a primary DAS dbfile is an SFS file using the new SHARED PATH keywords of the CREATE DBSPACE and ALTER DBSPACE commands. You can reassign all SFS DAS dbfiles from one server to another using the new sp_iqreassignsharedfiles stored procedure. Information on setting up and using shared-nothing logical servers, DAS dbspaces, and DAS dbfiles. DAS dbspace backup and restore. Setting TLS for DAS internode communication. SQL statements enhanced with shared-nothing multiplex support. Stored procedures enhanced with shared-nothing multiplex support. System views enhanced with shared-nothing multiplex support.